Return to a time before The Great War, return to the success of the Anchorage Reclamation Campaign. Return to the T-51 Power Armor! The T-51 Power Armor was the pinnacle of power armor tech before The Great War and continues to be a strong asset in today's world of synth's and deathclaws. 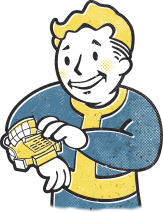 Now you can own a piece of history without having to navigate the wasteland!